Intro – Colorado Criminal Law – Know Your Rights – Remain Silent – Remain Silent – Remain Silent – One of the toughest constitutional rights to exercise is your Fifth Amendment Right To Remain Silent. This article is to help you when, where and how to exercise this critically important right! While I have written about these issues before, your constitutional rights and the situational exercise of those rights should be committed to memory and bears repeating as often as possible. First Understand Who Are You Talking To – Never Take A Chance – Exercise Your Right To Remain Silent! Law enforcement officers come in all sizes and shapes, they wear many types of uniforms or sometimes no uniform at all. The common theme – do NOT answer anything more than your name unless you are stopped in your vehicle (see below). You have no legal obligation to answer ANY questions asked by law enforcement officers… period. You have a Constitutional right to remain silent. Even if you are detained against your will. In Colorado, there are basically only two exceptions to the right to remain completely silent. Remember this, with the exceptions reviewed in this article – if you refuse to answer the questions of law enforcement you can never be punished – whether you are under arrest in the back seat of a patrol car, or sitting in your own living room. It is only when you answer the questions of law enforcement or volunteer information to the police that your answers can be used against you. A Judge, and only a Judge, can order you to answer questions where, if you refuse to provide those answers, (usually at trial in cases where you have no right to remain silent), that decision would be punishable by contempt of court – that issue is not the subject of this article. There are basically two limited exceptions to the right to remain silent. The first is the right of law enforcement to obtain your name when you are contacted upon a “reasonable suspicion” that you have committed a crime. The second, is the right of the police when you are driving a car to require you to provide your driver’s license, the registration of the car you are driving and proof of insurance for that car. After that providing your name – you DO NOT have to answer ANY OTHER QUESTIONS. So called “Terry Stops” and Vehicle Stops based on reasonable suspicion or probable cause. (2) Any person who violates any provision of this section commits a class 2 misdemeanor traffic offense. (1) A peace officer may stop any person who he reasonably suspects is committing, has committed, or is about to commit a crime and may require him to give his name and address, identification if available, and an explanation of his actions. A peace officer shall not require any person who is stopped pursuant to this section to produce or divulge such person’s social security number. The stopping shall not constitute an arrest. (2) When a peace officer has stopped a person for questioning pursuant to this section and reasonably suspects that his personal safety requires it, he may conduct a pat-down search of that person for weapons. If you are stopped by the police you must answer the question as to your identity, contrary to the words of the statute above, you do NOT have to answer ANY OTHER QUESTIONS especially if you have been arrested! After identifying yourself, you should “lawyer up” and ask for a lawyer immediately and repetitively until the police “get it.” Do NOT give in and answer any other questions. Demand a lawyer from every police officer you may encounter during the investigation. Do not answer questions unless and until you have first consulted with a lawyer and that lawyer is, either present with you, or is available to assist you with every single inquiry. The lawyer’s single obligation at that point is to guide you through the field of land mines that is a police investigation and to protect your rights during that journey. “Lawyering up” stops the legal right of the police to ask questions. They know this and should stop asking them – but once in a while a rogue officer or two will press for answers aware that the words they elicit, while not admissible against you at trial, may be useful in other contexts and against other targets. The police can use trickery to get you to “volunteer statements.” Do not fall for the games they play. Anything you say to the police is admissible against you at your trial. If you speak and you are found to have lied to the police you may be prosecuted. If you remain silent, that danger is removed. If you make the mistake and begin to speak to law enforcement you CAN STOP AT ANY TIME and “lawyer up” thus ending the interrogation. The standards for police contact vary on the quantum of evidence related to the commission or suspected commission of a crime. A police officer needs only “reasonable suspicion” and not necessarily “probable cause” to stop a car or a pedestrian to investigate potential crime. Either quantum of proof is enough. As regards “reasonable suspicion,” an “investigative detention” can only result in a brief and temporary – (significantly shorter than an actual arrest) detention against your will. To accomplish this legally, the police must be able to articulate a “reasonable suspicion” that you have committed a crime or were about to commit a crime for the stop and detention is lawful. If the police stop you on the street – tell them – politely after identifying yourself “I do not want to talk to you.” Then, ask them them if you are being detained or under arrest and what grounds do they have to hold you. If you do not receive an answer – ask – repeatedly “am I free to go now.” If the officer answers in the affirmative – then walk – not run – away. A detention – described more fully in this article, is NOT the same as an arrest. Colorado limits the time for a typical detention to approximately 20 minutes or so. While not an exact time limit – the courts rarely permit a detention much longer than 20 minutes. Here’s the practical side – if the police violate your rights – let them – do not resist – do not fight them – let them do what they intend to do – paying careful attention – and later – tell your Colorado criminal lawyer everything that happened. (3) the character of the detention must be reasonable when considered in light of the purpose. First, keep your head. Your hands should be at 10 and 2 on the steering wheel – where the officer can see them. If the stop is at night – (and you have nothing to hide from his or her view) – put on your dome light or other light to make the interior of the car visible. Roll down your window and wait for the police officer to approach.. Do not make any sudden moves – in fact – do not move until you are instructed to do so. As noted – in Colorado – you must show your drivers license, registration and proof of insurance if you are asked for these documents. The police officer also has the right to ask you to step outside of your car. BUT that is it! No one in your car has to answer any questions. (1) (a) Prior to conducting a consensual search of a person who is not under arrest, the person’s effects, or a vehicle, a peace officer shall comply with paragraph (b) of this subsection (1). (b) A peace officer may conduct a consensual search only after articulating the following factors to, and subsequently receiving consent from, the person subject to the search or the person with the apparent or actual authority to provide permission to search the vehicle or effects. (II) The person has the right to refuse the request to search. (c) After providing the advisement required in paragraph (b) of this subsection (1), a peace officer may conduct the requested search only if the person subject to the search voluntarily provides verbal or written consent. 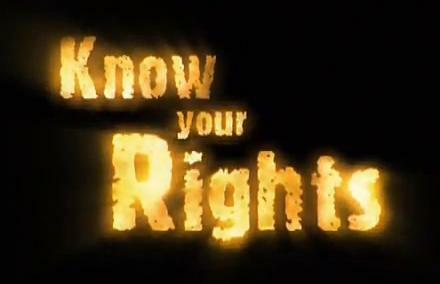 Other evidence of knowing and voluntary consent may be acceptable, if the person is unable to provide written or verbal consent. (2) A peace officer providing the advisement required pursuant to subsection (1) of this section need not provide a specific recitation of the advisement; substantial compliance with the substance of the factors is sufficient to comply with the requirement. (3) If a defendant moves to suppress any evidence obtained in the course of the search, the court shall consider the failure to comply with the requirements of this section as a factor in determining the voluntariness of the consent. (4) This section shall not apply to a search conducted pursuant to section 16-3-103, a valid search incident to or subsequent to a lawful arrest, or a search for which there is a legal basis other than voluntary consent. This shall include, but not be limited to, a search in a correctional facility or on correctional facility property, a detention facility, county detention facility, custody facility, juvenile correctional facility or any mental health institute or mental health facility operated by or under a contract with the department of human services, a community corrections facility, or a jail or a search of a person subject to probation or parole by a community supervision or parole officer when the person has consented to search as a term and condition of any probation or parole. Bottom line – law enforcement cannot search your car unless you give them your consent. In the absence of “probable cause” that criminal activity is likely taking place, that you have been involved in a crime, or that you have evidence of a crime in your car, they CANNOT search your car. Make your opinion absolutely clear – state over and over that you do not consent. You should be careful to make a responsible choice in selecting a Colorado Criminal Defense Lawyer – and we encourage you to “vet” our firm. Over the last 30 plus years – by focusing ONLY on Colorado criminal law – H. Michael has had the necessary time to commit to the task of constantly updating himself on nearly every area of criminal law, to include Colorado criminal law and procedure and trial and courtroom practice. H. Michael works hard to get his clients the best possible results in and out of the courtroom. He has written, and continues to write, extensively on Colorado criminal law and he hopes this article helps you in some small way – Colorado Criminal Law – Know Your Rights – Remain Silent – Remain Silent – Remain Silent. One of the toughest constitutional rights to exercise is your Fifth Amendment Right To Remain Silent. This article is to help you when, where and how to exercise this critically important right! While I have written about these issues before, your constitutional rights and the situational exercise of those rights should be committed to memory and bears repeating as often as possible.